Accurate Locksmiths of Omaha is a long-time customer of JM. 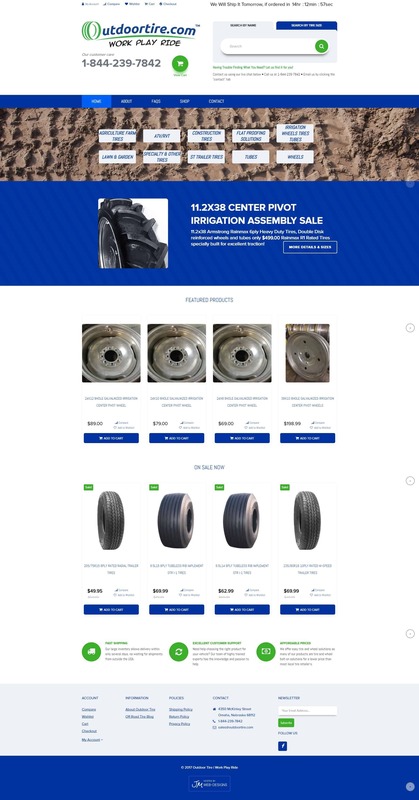 After many years of using their custom website, they decided to update the design and technology to meet the needs of their customers. 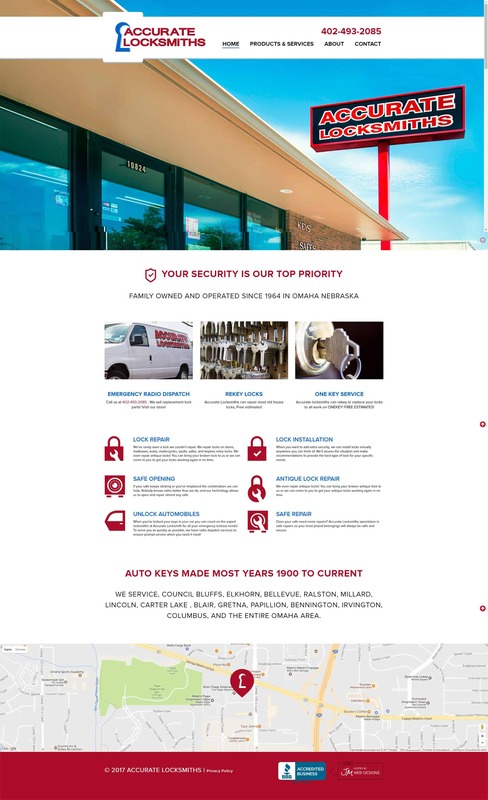 Accurate Locksmith’s new website is built on a WordPress Content Management System and utilizes a pre-built WordPress template. This template is customized for Accurate Locksmiths and provides an affordable website solution for updating a website design with mobile-friendly technology. 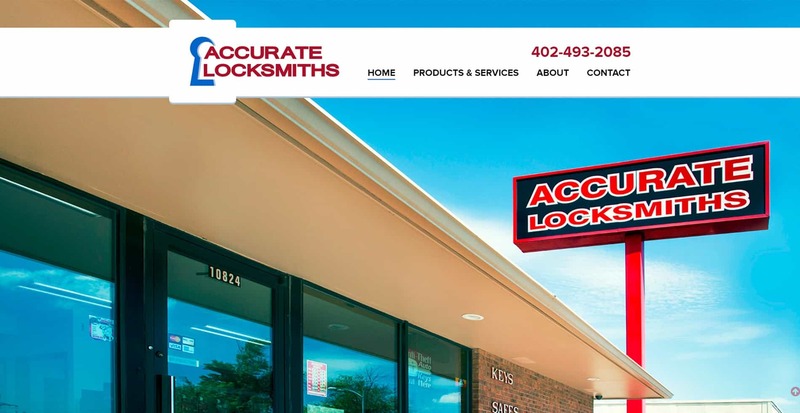 We’re grateful for the continued trust and business of Accurate Locksmiths and hope this new website design and technology will allow them to better reach customers. Paying attention to even the smallest details on your ecommerce website will drive traffic, increase sales, and keep your customers happy this holiday season. The care that goes into each aspect of your store, marketing and support are important in gaining and closing website sales. So, before the holiday rush arrives, let’s make sure your website settings are set up for success. Don’t be caught off-guard when your stock levels are low. You can set low and out-of-stock thresholds, and set up notifications if inventory is running low. During the busy shopping season, and depending on how quickly your products sell, you may want to increase the low stock threshold. Consider increasing to give shoppers an earlier warning that inventory is getting low. Checkout settings should allow for efficiency and ease for customers. If possible, ensure guest checkout is available for users who do not want to create an account. Also, review the checkout settings for coupons. If you’re going to be offering coupon codes this year, you’ll want to make sure that setting is checked – or you may have some unhappy customers. Make sure customer email notifications are in place. WooCommerce offers many email notifications that go directly to the customer – including on-hold orders, completed orders, refunded orders and customer notes. These emails can also be customized to fit branding. Keeping customers informed about your progress will create long-term, happy customers. Implement store notices for effective communication. These notices can include holiday shipping cutoffs; sales, discounts, or other special offers; deadlines for redeeming coupons; or unexpected delays and issues. There are also cart notice extensions that allow in-cart messages for shoppers. Call us at 402.292.7500 ext 102 for assistance in optimizing your ecommerce settings for the holiday season. Outdoortire.com is a new business started by seasoned tire professionals looking to provide their product directly to consumers with affordable pricing and excellent customer service. Seeing the growing opportunity to provide this product through an ecommerce website, Outdoortire.com exists to make consumers’ lives a bit easier when tire shopping. Being a new business, JM’s Omaha design team first designed their logo and brand. The Outdoortire.com website is built on a WordPress Content Management System and uses a WooCommerce ecommerce plugin. The site is a pre-built WooCommerce template customized to fit their needs. It utilizes an advanced search plugin for better user experience, and a LiveChat feature to provide excellent customer service. We wish Outdoortire.com great success with their new ecommerce business. Our Omaha web design team is excited to see it grow and succeed! Maximizing revenue with an optimal checkout process during the winter season is critical for your holiday sales. Shopping cart abandonment occurs when checkout is confusing, when users are forced to create an account and there are payment security concerns. When shopping cart abandonment does occur, there is a WooCommerce plugin that can help recover 30% of revenue lost by abandoned carts. By sending email reminders to customers and guests, the plugin helps go for the close. However – why even get to cart abandonment? Let’s focus on some key ways you can improve your ecommerce website’s payment process and convert prospects into customers quickly and effectively. Build trust with your customers for an effective online sale. Make sure your website makes clear your shipping and return policies – instead of leaving customers guessing. In the event that customers have questions, easy access to customer service is vital. Live Chat is an affordable and simple way to make sure customers can have their questions answered quickly so you don’t lose the sale. Checkout obstacles are also detrimental to closing your online sales. We know you want to collect customer data. It’s helpful for marketing, support and research… but forcing customers to create accounts will cause lost sales this holiday season. Offer a guest checkout option to ensure completed sales. Investing in mobile-friendly, responsive website technology is also going to help close online sales. If customers need to zoom in/enlarge the browser to click on the appropriate product, can’t read the text, cannot easily enter info in checkout fields or are waiting for pages to load… you’ve likely lost that sale. Having a mobile-friendly website is no longer optional – it’s a must-have, make-or-break, you-better-get-it-now decision for your business. Lastly, offering more payment options may help close your online sales. WooCommerce offers a deposit extension which allows for monthly payment options, and PayPal offers a credit solution to merchants that comes at no risk to merchants. And during the holidays, everyone knows that monetary flexibility can be critical to closing a sale. Having trouble closing online sales? 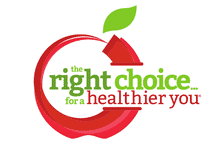 Give us a call at 402.292.7500 ext. 102 to find out how we can optimize your website’s checkout process. ServiceMaster of Sarpy County provides a variety of services to many Nebraska and Iowa counties. Our Omaha web design firm worked to provide an updated website design that’s mobile-friendly and would more easily show their variety of services. This website is built on a WordPress Content Management System (CMS). After selecting a pre-built WordPress template, our Omaha web design and web development team customized it to fit ServiceMaster’s needs. This CMS also allows ServiceMaster to continually update and build their website with little hassle. 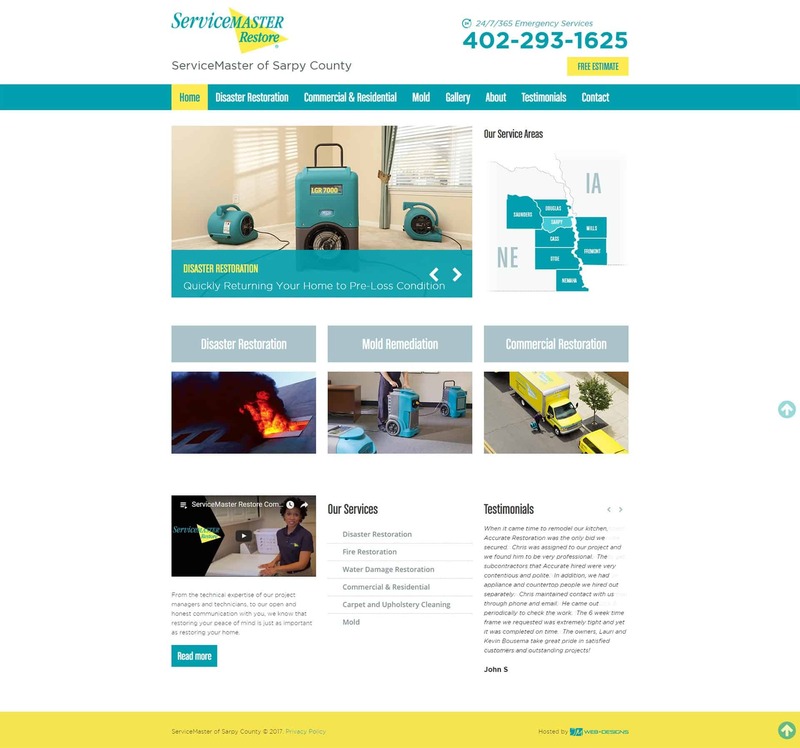 Best of luck to ServiceMaster with their new website and we look forward to watching how they grow with this powerful marketing tool. November 2016 marks JM Web Designs 19th birthday! It’s hard to believe that 19 years old, a 14-year-old started a successful Omaha web design company that’s built hundreds of websites, provided countless jobs and served a multitude of Omaha businesses. JM has been through many seasons and transformations, and today stands as a pillar for web design, web development and internet marketing in the Omaha-metro. With a 98% client retention rate, we will continue to serve and care-for our customers; providing them with websites and services that will increase their revenue and provide peace-of-mind. We are incredibly grateful for our customers, our partners, our city and our loyal employees for 19 years for service. Thanks for trusting us with your websites, marketing efforts and web hosting. Cheer to 19 more years! Wanting to enhance your ecommerce website for the holiday season? With the ease and flexibility of WooCommerce, our Omaha web design and development team can assist in plugin upgrades and additional extensions that can increase sales and enhance user experience at an affordable cost. WooCommerce is widely used and revered for providing a customizable ecommerce platform that’s easy to update, simple to use and affordable to improve. WooCommerce has hundreds of free and paid extensions to extend a website’s functionality. From complex SEO plugins, simple widgets, and everything in between – if you can think of it, there’s probably a plugin for it. Out of the box, WooCommerce gives online businesses the ability to sell multiple types of products, including physical goods, items with variations and digital products. But having our Omaha web development team add in extensions, your online store can start selling memberships and subscriptions, export customers for extended marketing and add more sophisticated product search and sorting. Additionally, as the holidays approach, it may be beneficial to look into more customizable shipping – to stay competitive with larger retailers – as well as dynamic pricing for offering bulk discounts, category discounts and role based discounts. Making updates to your ecommerce website before the holiday rush begins will ensure your success and profitability during the largest online retail time of year. To learn more about extensions and upgrades for the holiday season, call 402.292.7500 ext. 102. Host Coffee in Omaha is a long-time provider of coffee, water, and – most recently – vending machines and micromarkets in the Omaha-metro. And as a staple in their industry, Host Coffee needed a new website that displayed, in both design and content, their services and experience. Our Omaha web design team customized a pre-built WordPress template to fit their needs. This WordPress Content Management System (CMS) provides Host Coffee the ability to update their own website content and images, and utilizes responsive technology – providing a mobile-friendly website for an ever-growing mobile browsing population. We’re thankful to work with a trusted company like Host Coffee and are excited for continued partnership as their grow and see success.